What is DevOps? Is it technology? Is it a process? No, DevOps is much more than that. DevOps can be considered a concept, a culture, a development, and operational philosophy, and a movement. It’s also shaping the way BI and Analytics are deployed. The DevOps movement started to come together sometime between 2007 and 2008. This is when IT operations and software development communities started to talk about problems in the software industry, specifically around the traditional software development model. The main problem was the organizational separation between the people who wrote the code and those who deployed and supported it. Whether you first learned about DevOps from the famous book, presentation, or conference, there is no mistaking that the primary purpose of the DevOps culture is to increase collaboration between Development and Operations teams. Essentially, all references make the claim that the only rational way forward (in this digital world) is for development and operations to be seamless, transparent, and fully integrated. Today, the DevOps movement promotes an attitude of shared responsibility that encourages closer collaboration, and eliminates the silos between departments, and acts as a never-ending journey for continuous improvement and greater efficiencies. If we could sum up DevOps culture in one word, it would be “collaboration”. Creating a culture of shared responsibility, transparency, and faster feedback is the foundation of every high performing DevOps team. Teams that work in silos often don’t adhere to ‘Systems thinking’—a crucial principle of DevOps. ‘Systems thinking‘ is being aware of how your actions not only affect your team but how they also affect all the other teams involved in the development and release process. In order to break down existing silos, DevOps requires a change in mindset where you must begin to look at the development process holistically—thinking of the whole rather than the parts—and how DevOps relates to each one. Once the silos are broken down, DevOps attempts to fill the gaps by forming a partnership that emphasizes communications, collaborations, and integrations. Think of it as a chain reaction: DevOps promotes collaboration, collaboration is facilitated by automation, and automation orchestrates improved processes. With DevOps aiming for greater efficiencies between software development and IT teams, it was clear that automated processes needed to be put in place to build, test, and release software faster and more reliably. Speed became the main battle cry, even if it meant compromising on the quality of the final output. The DevOps culture and methodology is purpose-fit for this exact stage. With devs pushing for change, and ops driving for stability, these two teams need to unite and learn how to pull from each other’s experiences, concerns, and perspectives. If they can learn to collaborate, then they will be able to continuously improve processes, build high-quality releases, and deliver a product that will delight end users. While developers enjoy these streamlined processes, other team members may need more help in coordinating sequences for deploying and testing the application. This is where the entire team should take a step back, map out the entire process, and make sure everyone is on board and feels comfortable with the new processes, and their role. The good news is that with ten years of DevOps behind us, we know that teams practicing this methodology build and release product versions more frequently. And what’s more, the quality and stability of the release are not affected either! 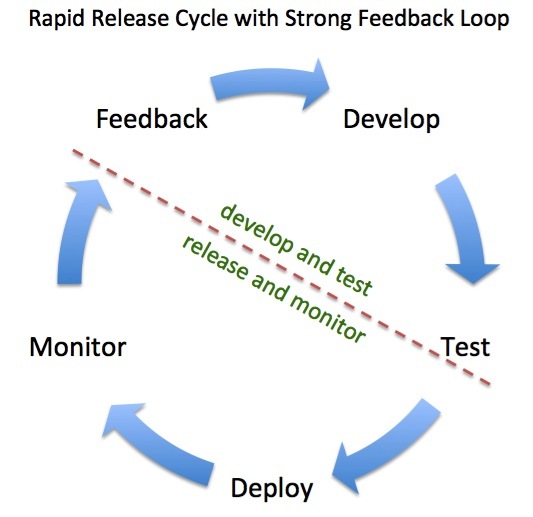 One of the main goals of DevOps is to aim for continuous improvement, so a strong feedback cycle is a must. Automatic monitoring of systems is critical to ensure production systems are fully functional. These systems should provide an adequate level of service, troubleshooting, and handle issues before end-users encounter them. As part of this continuous process, you will need to pinpoint issues, and then take corrective actions that should be implemented during the next development iteration. You should be improving the quality of your application with each release. And it’s not just about the product. The DevOps movement strongly values feedback in order to continuously improve the way in which developers and operations staff work together. Once your team starts saving time and efforts in this area, you can move on to all those projects on the back burner that add even more end-user value to your product. A major challenge in development and release processes is managing the infrastructure for all environments. Cloud computing helps us overcome this hurdle by providing flexible on-demand resources and environments. Cloud computing allows developers more control over their own components, eliminating friction with older, slower systems. By working in a cloud environment, developers can create self-service methods for provisioning infrastructure without the need to wait for IT to provision resources for them. Developers can “own” their own components, quickly trying new things, failing fast, and moving on to the next iteration until finding success. Cloud computing can also play a role in the cultural change of the company. With DevOps needing a shift in mindset, implementing cloud computing can help developers deliver new services with new, automated processes. Adopting the DevOps movement in your IT department can mean faster delivery, more collaboration between teams and better processes overall. These benefits extend both to cloud businesses and traditional enterprise data centers. Our Linux deployment is all about DevOps. The DevOps movement is what makes our Linux offering mandatory – Kubernetes, Containers – these are the standard tools of DevOps. How you automate the provisioning of new servers. How you scale up – and add additional servers when your system is under load. How you take down services when you have low traffic. And now Sisense offers a deployment that is completely DevOps friendly.